Ornamental Design for a Paste Box cover. Class 4. 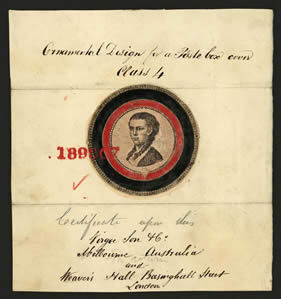 Certificate upon illus. [in pencil] Virgoe Son & Co, Melbourne Australia and Weaver's Hall, Basinghall Street, London. In return [in pencil]. Words and letters were not considered acceptable as parts of an ornamental design for design registration. By using the zoom facility you can see some of the deleted text (in the ring surrounding the lady's head in the design), including the words 'preserving the teeth and gums' and 'prepared by Alfred Felton, Melbourne'.